I’ve been meaning to get out and get some photos myself, but. . .well. . .it’s just been too hot! That is hot! Hope you have air conditioning! Yes, and it is running full blast! We’re having a heat wave for sure!!!! I am so sorry to hear that. Everywhere I hear news of the devastating affects of this weather. Hopefully it will break and we will get some relief soon. yeah it’s too hot … haven’t shot anything either.. just trying to cope. I think that coping is the best any of us can do. I miss getting out with the camera, but I just can’t take this kind of heat. Yes! We’re having a heat wave! 105, just ridiculous. I have been wanting to snap some shots outside too but I just can’t take the heat. To the car and where I have to go, back to the car and back home to the garage. I hope the heat wave breaks before you have to move! I think the entire country (USA) is under a heat advisory! Unbelievable. Going to the store is a chore during this weather. Thanks for the kind thoughts. I, too, am hoping that we get some relief by the time we move! 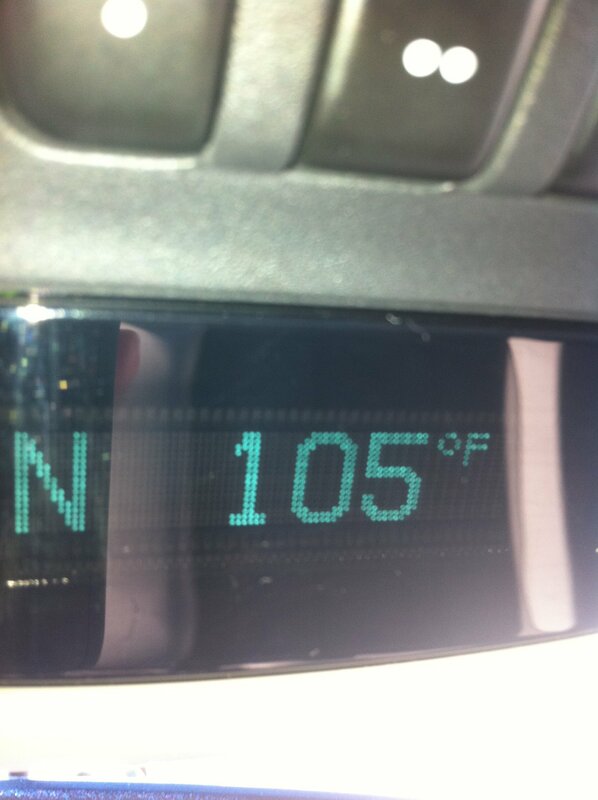 Actually Mom-this is actually the temp OUTSIDE my car!!! The warehouse was disgusting and I am definitely worried about our employees…just horrible! Wow Mica, I hope this heat wave breaks real soon. I can’t believe the number of folks who have already lost their lives because of the heat! So sad. BTW, I corrected the post to indicate that the temp was outside your car and not in the car. Miss you. Phew! I saw on UK tv this morning that 20 people had died in Otowa. due to heat. I did not realize that it was all over USA. Stay cool as best you can! We have had temps 37% C and I am not sure what that equates to in Farhenheight but it sure has been hot enough for me. Just remember ..never go without your water! Wow. I heard yesterday that Europe is really suffering through the heat, too! Is Bulgaria in this heat wave? At any rate, yes we take water with us wherever we go, and the sunscreen and the sunglasses and widebrimmed hats, etc. You do the same. Man, I really feel sorry for the people in other states that aren’t use to this heat. Here in Texas this is a normal thing. I remember having 30+ days in a row at 100 or plus before. We are Texans, we sign up for this stuff. I grew up in Louisiana, but this is too hot for me! Of course, we always considered TX to be hotter than LA! Thanks for stopping by. Hope you are finding ways to stay cool. Yes, it has been crazy hot just about everywhere! I hope you are managing to stay cool.